Online shopping from a huge selection of Cool Gadgets at the Right Price - Site-Wide Free Shipping; Buy LED &amp; Xenon flashlights, computer parts and peripherals, ipod accessories, NDS accessories, R4, M3, X9, AK2, DSTT DS Flash Carts, and get tips and reviews, cheap gadgets at DealExtreme.com. Dealextreme is a Chinese wholesaler where you can shop in the comfort of your home, it is a consistent online electronic gadgets store based in Hong Kong. They offer a massive collection of gadgets at very cheap prices and they deliver worldwide for FREE! (Although you will pay for local post office fee about SAR 2.84 or $0.76 in my case here in Saudi Arabia) Their website has a display place to make easy to find what you need. One of the most I like with this website is there are useful customer reviews for each items that will help out to decide if it’s a valuable to buy. • The Price: One word “CHEAP”, prices of DealExtreme are VERY competitive. When buying in them you don’t have to order in bulk just to have discounts on them. DX sell cheap and simple things. If you’re a collector or just looking for small novelty things you are in the right place. • Shipping Cost: Again one word “FREE”. Although you can use some commercial shipping company like EMS but for small items the price will surely blow up. The majority of the electronics manufacturers are in Shenzhen which is the biggest electronic market in the world. They have a good relationship with these companies, a big help for their advantage. Almost all the products are shipped out in Hong Kong which is near to Shenzhen via HONG KONG mail. • Delivery of the Products: In this part you should be patient, delivery time may take 2 to 3 weeks or sometimes longer. I’m not against Hong Kong post but really sometimes their service is questionable. • Product Quality: Surely DX is searching for a quality manufacturer for the products they are selling but don’t expect FIRST-CLASS quality products. But in some cases this really doesn’t matter because of the Price-Quality of the products. • Payment and Security: As far as I know they only accept Paypal an online bank owned by eBay. They also manage to have a Geotrust Premium SSL certificate so that the transaction will be secure. • Service: If you will sign up you will see the option for a real time inquiry in their staff (offline most of the time) or you could send the staff a message about your question online. If you like to ask them about a specific product in their website you can send them a message. After purchasing if you choose to pay your item with tracking number you can easily trace it with DX. If you can check the ranking of DX in Alexa.com you can see that their ranking is much higher that LightintheBox or in any other China Wholesalers. Even though Dealextreme is not paying to much to Google to have a good traffic for their site, meaning lots of old and new visitors a coming back to this website even without using the search engines. Some of the new wholesalers are adopting this kind of platform they are also offering a wide-site free shipping method. For example: Focalprice.com, Dinodirect.com, Bestofferbuy.com and Chinabuye.com. • It took a month for the package to arrive. Sometimes more than that. • Not advisable for a dropshipping business. My first order in Dealextreme is just for a trial test of their service I order 3pcs of Bluetooth Adaptor costing $1.85 each and a Windproof Butane Lighter, I aware about the delivery time of my order so I wait. They send me an email telling that my order will arrive 10-20 working days. There is no problem with my part so I patiently wait for my Items to arrived I just assumed that this estimate is only applicable in some nearby country or in the United states and for my order maybe it will take much long because I’m here in Saudi Arabia. In my surprise the items cam much earlier than I expected, actually it only take 8 days since that notice. My item was packed with bubble wrap and the order is declared as a gift, possibly to stay away from extra custom charges. When I open my package there is a letter saying that my second order is not available and they will send it once the item becomes available. Meaning another fee to be paid at the Saudi post office. After a few weeks when I check again to my order has arrived. Even though this happens, I was pleased with their service, atleast they a decent enough to send my package. If you are planning to buy some cool gifts or some novelty items to sell or for personal reason consider Dealextreme as top of your list. Don’t expect too much regarding the quality and fast delivery of your order, in this factor patient is a must. Communicate regularly to their staff before ordering and after it. But I can assure you in the end it is very rewarding for you. For information I do use Dealextreme occasionally in buying some unique items for my SMALL buy en sell business in our city. I may not tackle all the information’s about Dealextreme.com, any other review from your part will very helpful for some buyers to decide in buying thru their website. 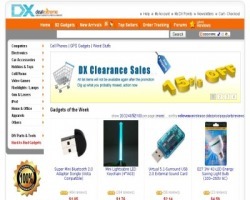 DID YOU FIND THE DEALEXTREME REVIEW HELPFUL?